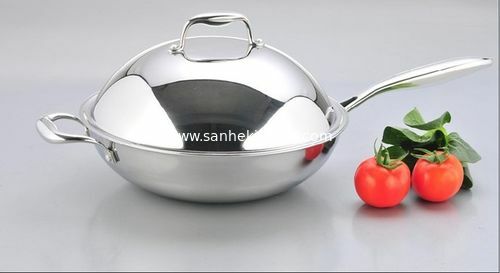 Stainless steel tri-ply cookware's body and bottom are all three layers of stainless steel, medical grade stainless steel aluminum composite metal material is refined. The inner layer of stainless steel 304 (18-10), nickel-containing 8% to 10% for high-quality, the corrosion resistance is stronger than plastic. The middle layer of aluminum, for good 1050 series ,thermal conductivity performance is good. The outer layer of stainless steel 430 (18/0), high hardness, containing carbon components, so magnetic that can be used in the cooker and stainless steel 430 finishing is nice. The products are not only strong corrosion resistance, high temperature, thermal uniformity and quick heat storage performance, but not paste non-stick fry process no fumes. The cooking process without open fire, a small fire in the fire that you want to achieve the same desired effect. Use stainless steel tri-ply cookware pot will help you to save gas energy and time, you can reduce the amount of ingested cooking oil to reduce the open hood, save power, easy to clean, suitable for all kinds of stoves. - Quality: high-tech stainless steel aluminum composite metal material integrally molded and refined. - Nutrition: destruction of food nutrients, natural fresh meat, the flavor is not lost. - Health: reduce fried, fried fats intake, to achieve the effect of lipid-lowering, hypoglycemic. - Environmental protection: fry paste sticky, use more environmentally friendly. - Energy saving: thermal speed fast thermal storage performance, energy savings of 20% or more. - Health: the inner and outer layers medical stainless steel, bacteria difficult to breed in the surface and easy to clean. - For: Suitable for all kinds of stove (cooker, gas, electric furnace, open flame). Nice design and high quality tri-ply cookware to give you beautiful cooking!